I'm going to get straight to the point on this subject as you'd expect from a direct talking River Tay ghillie and successful promoter of Scottish salmon fishing. Like any field in life if you search about enough you'll find those professionals who are operating on a much higher frequency than others. Catching a salmon is a tricky proposition no matter who you are and that is a big part of the excitement & challenge of fishing for them. While the masses often 'moan & groan' about declining Atlantic salmon stock numbers many anglers and ghillies have seen it all before. The first lesson is understanding the 'cyclical' nature of these fine fish and blotting out the negativity from this sport that is often so rife. This doesn't mean that we've not seen a stock decline in recent decades but don't let negativity creep into your game as I'm 100% convinced salmon can sense that and will steer well clear of that frequency. Without proper meaningful instruction where all relevant fishing points are successfully taught you will more than likely be heading for a blank day or season. Getting your fishing approach just right is so important and sadly the marketing of Scottish salmon fishing without proper qualification has destroyed the chances for thousands of would be salmon fishers staying in this amazing pursuit. Follow this link to book tuition from a top performing Scottish salmon guide. This year alone I know professional guides and anglers who've caught between 50 to 100 salmon to their own rod in what has been generally regarded as a disasterous season by many anglers. Search for the guide who you know fully understands salmon and the river and can hook fish for fun and remotely make his guests do the same which is what 'real' salmon guides shine at delivering. 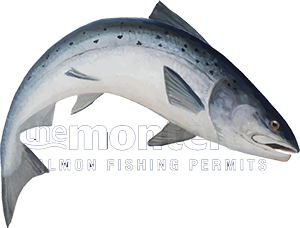 A true professional salmon guide will view his guests as a 'remote control' for catching a salmon and will get a buzz when he succeeds at having a guest do the job themselves with limited yet 'effective' instruction and fishing time. It's all the relevant small details from getting a consistent line out to making sure each swing of the fly is spaced correctly to brainwashing the guest through 'salmon take simulation' on exactly how to deal with a cooperating salmon if & when that moment appears. If any of these vital components are missing the chances of success are diminished. From what I've seen over the decades is that the general angling skill set is poor as the majority of salmon anglers have never taken professional instruction or even knew where to find it. Invest in a day on the river with one of Scotland's most renowned salmon catching machines and do so with your ears fully open and in 'dry sponge' mode. If you do so you'll more than likely come away with a completely different view on how to approach the salmon river and increase your chances significantly of becoming consistently successful at catching these fine fish. The real things that matter in salmon fishing are all very logical therefore easy to understand, retain and implement.